Excel built-in data sorting is amazing, but it isn’t dynamic. If you sort data and then add data to it, you would need to sort it again. In this post, I will show you various ways to sort data in alphabetical order using formulas. This means you can add data, and it will automatically sort it for you. This formula compares a text value with all the other text values and returns its relative rank. For example, in cell B2, it returns 8, as there are 8 text values that are lower than or equal to the text ‘US’ (alphabetical order). This formula simply extracts the names in the alphabetical order. In the first cell (C2), it looks for the country name that has the lowest number (Australia has 1). In the second cell, it returns Canada (which has the number 2) and so on.. 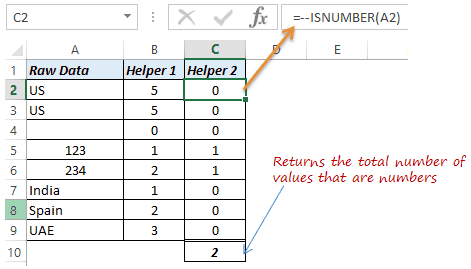 Here is a formula that will do the same without the helper column. This is an array formula, so use Control + Shift + Enter instead of Enter. I will leave it for you to de-code. This formula works well if you have text or alphanumeric values. You have duplicates in the data (try putting US twice). There are blanks in the data. You have a mix of numbers and text (try putting 123 in one of the cells). You can see there are duplicate values, blank and numbers. So I will use helper columns to address each of these issues. It returns 0 for blanks. In the case of duplicates, it returns the same number. Text and numbers are processed parallelly and this formula returns the same number for text and number (for example 123 and India both get 1). The idea for this formula is to segregate blanks, numbers and text values. If it is text, it returns the comparative rank and add the total number of numerical values and blanks. For example, for India, it add the text’s comparative rank in text (which is 1) and adds the number of blank cells and the number of numerical values. This method of sorting now becomes fool-proof. I have shown you the method for 8 items, but you can extend it to as many items as you want. If you can handle extreme formulas, here is an all-in-one formula that will sort data in alphabetical order (without any helper column). Enter this formula in a cell and drag it down to get the sorted list. Also, since this is an array formula, use Control + Shift + Enter instead of Enter. This formula has real-world utility. What do you think? I would love to learn from you. Leave your footprints in the comments section! Step-by-step Guide to Use Sorting in Excel. In my case, I was actually needing to sort column A by the alpha order of Column B. Meaning that for all the duplicates in Column B, I actually had a unique value in Column A, each of which I need to list. 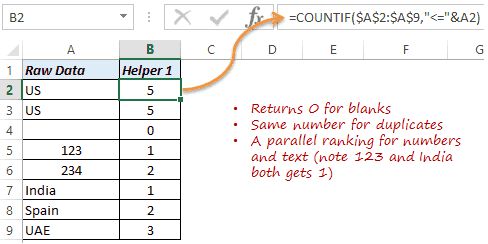 I simply added two more helper columns, helper 4: counted the occurrences of value of column B in range column B, helper 5: added helper 4 and 5 together, and voila! Very good for me ! I adjusted it and it works. But …. How and what must it be changed in formula to have number sorted descendig and the text unchanged, at the end ? Thank you in the event of a reply! Wonderfully helpful — thank you. The way you’ve structured your explanation is excellent; you’ve communicated the information with great clarity. This only appears to work if the range is a text range rather than text returned from a formula. 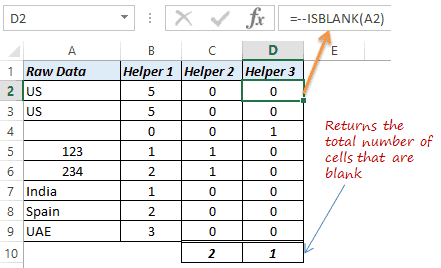 If the range is cells with formulas it appears to sort the blank or zeros at the top rather than the bottom. Is there a way to sort this? How would you work the above solution if there were names (first name and Surname of a person)? to handle duplicates, I just add the row number divided by a huge number to the rank. So, something like =A4+row()/1000000000. This will make every rank unique. I need to sort a names list alphabetically, primarily by the last name, together with the first name and a student number. I obviously want the first name and student number to match up to the last name after sorting. Is there are a way to set this up automatically so that as I paste raw data into 3 columns – LAST NAME, FIRST NAME, STUDENT NUMBER, 3 formula columns will fill-up automatically with the sorted data? I have 100’s of students to sort this way each term and repeatedly using the “sort” function is tedious. How can I get the following formula to ignore cells which has a formula in, but appear blank? Even better would be a formula that removes duplicates and sort the data alphabetically. This source data is text only. “–ISBLANK” I had to change to “COUNTBLANK” and then it worked fine. 2 – Duplicates still appear in the result column. How can I have it remove duplicates in the result column? Hi Sumit. The forumala doesnt seem to work for me :/ When i click enter it become N/A. At the bottom it says ciruclar reference 🙁 can you please help? 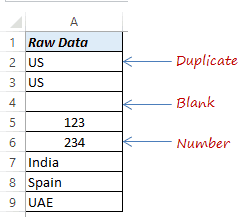 Hi i have the below formula, but it appear 0 in the cell, how can i make the cell in blank in adjusting formula. So helpful Sumit! This works great. I am using this to alphabetize a dynamic personnel list. But when two people have the same last name, the first person shows up twice and the second person is lost. Of course it takes another level of checking (first name will do). Any advice? Never mind Sumit, I got it! Thanks anyway. I would think some sort of an array but any help would be most appreciated. Well done, Sumit! Until I consulted your well-written article the only way I had thought of to sort a table column without using the Sort command was to use a pivot table (which still requires a refresh if the contents of the source column change). I had also tried using conditional formatting to warn the user that the column was no longer sorted, but conditional formatting rules break easily when you move the contents around. I assume your solution works with Excel tables and will find out shortly. Also glad to see someone else uses the =index(match(…)) combination, which I find more reliable than vlookup and lookup. Hi Sumit, Thank you for posting such a fantastic tutorial. I needed an array like this to sort data from one source into another, and the “One Formula to Sort it All (without Helper Columns)” solution was perfect once adapted. One thing though, could you show me how to add a conditional filter to the match? I have a sorting array (thank you ) in “Sheet 2” that works perfectly to grab unsorted data from column “E” in the sheet “Level 4”, and then it sorts the data, drops any blanks and returns a list sorted by “Last Name”. What I need to add to this array formula is the filtering of data based on the “City” in column “G”. I’ve tried to carry on, but I am thoroughly stuck. I have changed the formula as follows, and although it picks up the first match correctly, it doesn’t parse through the data to give any other matches, just the same one over and over again. Help! I'm spiraling into excel hell! Sumit, please help. You wrote this formula. If anyone can solve this, it’s you! Hi..I am trying to use this formula but am facing a problem. My datasheet is different as i have a list of names and the scores against it ( which obviously will have duplicates). I have arranged that using helper 1 in a new column. If I use this formula, the same name gets repeated for the same score. Please help with this problem. Am stuck at this since 4 days now. Thanks in advance. Hi- first, you are brilliant- and this formula saved me! But, I have a question…I need the associated data in the other columns to sort WITH my “Client Name” column which I want auto-sorted in Alphabetic order so that I can add Clients without having to manually sort each time. So, for example, I have “Client Originator” and “Client Owner” that is associated with each client. When they auto sort, the Originator and Owner info needs to sort too. Help! Many thx in advance. The better way would be to sort one column only, and based on the sorted data, use VLOOKUP to fetch all the remaining records. Really a great contribution. Helps a lot. Many thanks indeed. What if I want to sort cells with on Column A which greater than zero on Column C? Is it possible to sort it with a simple formula but not array? This works great in the first 30-40 columns, but if I try to use it in column AW for example, it doesn’t work. Any reason for that? Hey Sumith . Can u just help me in arranging from descending order? I kinda modified the formula but dint work! Hi, great formula but I am having some difficulties. 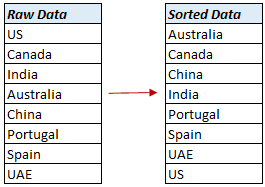 The blanks in my data set appear after the last number in the data set therefore when I apply the formula the blanks appear at the top of my sorted list. Is there a method to make these appear below the numbers in the sorted list? Much appareciated! Yes! that’s exactly what I need. Thanks … could you provide a solution please? 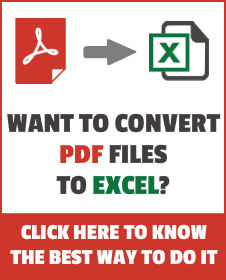 Use the download file in the tutorial. You’ll get this in the second tab of the workbook. This formula is awesome! Can you share how you get the spaces to appear at the bottom? I am trying to sort my data that has been pasted into a spread sheet that will transpose to another sheet and place the names in alphabetic order. Hello James, you can use the TRANSPOSE function to do this. Hey Sumit bhai you did a awesome job…. i have also made a formula …..
A shortcut is available when referencing ranges. The shortcut uses square brackets, as shown in Table . Thats a great tip indeed.. it really works for me, although I had to put lot of mind to understand it. Real world utility? I would guess it is good for feeding in a NamedRange for Data Validation, so that you validating list always come in sorted order. What you say? Thanks for commenting. Named range + Data validation would make an amazing use of it. It can also be used to get the sorted data in another location/worksheet (in case of employee names or any types of Ids). I got this query from a friend who wanted to sort id names and numbers using a formula. very clear and helpful… thank you Sumit! Wow, thanks for this amaizing exemple!!! I have had really needed it. Thanks for commenting Rose. I know the final formula is a bit too much to handle. But I have tried making it robust to handle all situations (numbers, text, duplicates and blanks). Thanks for commenting Ryan! Glad it works for you.